Fifty seven years ago, on a wintry weekend, Tom Dresser got together with his brother George, neighbor Martha Truesdell and friend Jimmy Welsh. Together they created the first issue of the Springdale News, a four-page, handwritten newspaper. That was February, 1958; the exact date is lost in the annals of time. 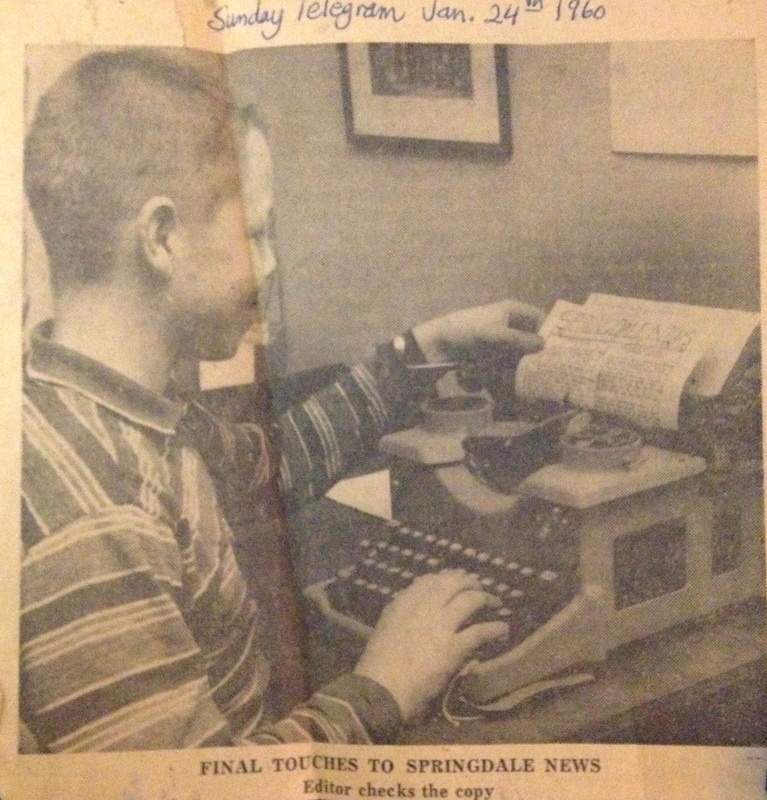 By March the young entrepreneurs had acquired a used mimeograph from the junior high, for $5, and proceeded to publish a second issue of the Springdale News, complete with neighborhood gossip, local political points, humor, news and sports. More neighbors, friends and relatives cycled through the masthead over the years, contributing various articles on current football stars, political aspects on a sewer system, poems, cartoons [Ricky Rat was a hit, as was Fearless Fastwick] and a great deal more. Stories included the controversial prediction that President Kennedy would die in office. That was based on the historical anomaly that the president elected every twenty years from 1840 to 1940 died in office; the streak was broken in 1980 when Reagan was wounded, but did not die. Local news included which neighbors' cat had kittens, and which babies were born. The Springdale News reached a monthly circulation over 300, at 5 cents an issue. Eventually, the editors, writers and publishers grew up, but for eight years, and a hundred issues, the Springdale News was, indeed, Holden's oldest newspaper. To purchase a copy of the 30th anniversary edition of the Springdale News, with highlights through the eight years of operation, send $10 via PayPal to this site. Make sure you include your mailing address.